The remote and untraveled area was chosen to insure that no one would be harmed by falling space debris. But, of course, “remote and untraveled” refers only to human traffic. After reading the article below, I started to wonder what the burial of a spacecraft would be like for the ocean’s inhabitants. And so wrote the words below. Afterward, I started to wonder when — and for what reason — the beliefs we have of our world might be similarly blown apart. 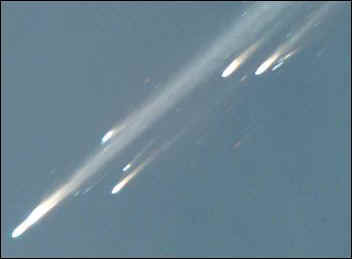 Photo credit: Mir breaks up upon re-entry into the Earth’s atmosphere. Photo taken above Fiji on Friday March 23, 2001. Photographer unknown.